Plano, Texas is an affluent large suburb just bordering the north side of Dallas with a population of 275,000 people. It is the 9th largest city in Texas. While the City of Plano has a wide diversity, it is also home for many celebrities and major corporations. 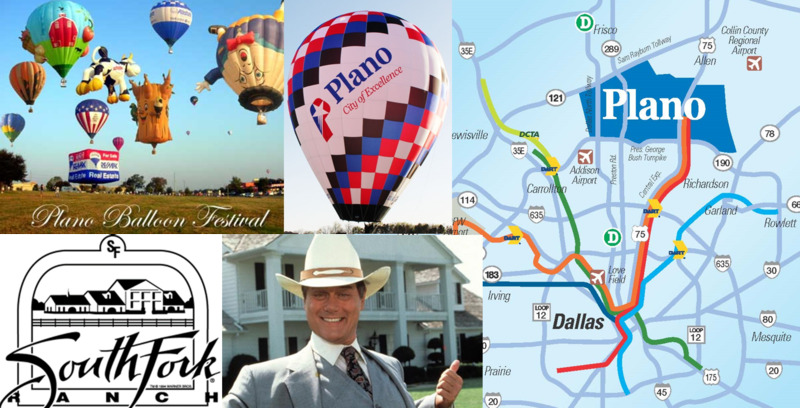 Within one mile of the Plano city limits is the Southfork Ranch made famous with J.R. Ewing in the television series “Dallas”. The Plano Star Courier is a biweekly newspaper which comes out on Thursday and on Sunday. The Sunday edition hits most the major homes in Plano, a total of over 60,000 households. 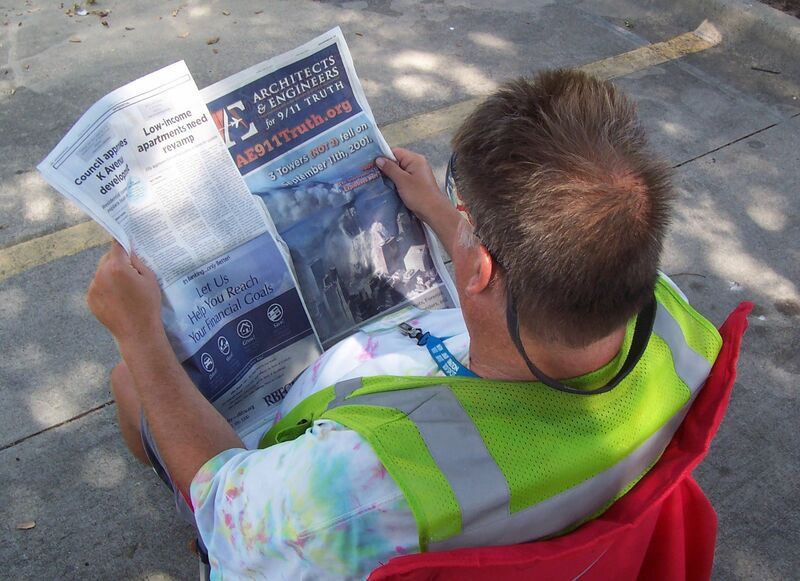 In time for July 4th Independence Day Holiday weekend, the Sunday June 26th Edition is a “keeper issue” because it features “Progress 2016” which contains advances in local business, education and government over the last 12 months. This is a direct link to the online version of the newspaper ad, found on page 21A. Depending upon your browser settings, to the right side of the webpage you will see a scrollbar of all pages in the newspaper. As you scroll down, you will see the latest “E Edition”. On June 26th, the ad will be in that E Edition. Star Local Media publishes the Plano paper along with a list of other suburban papers. 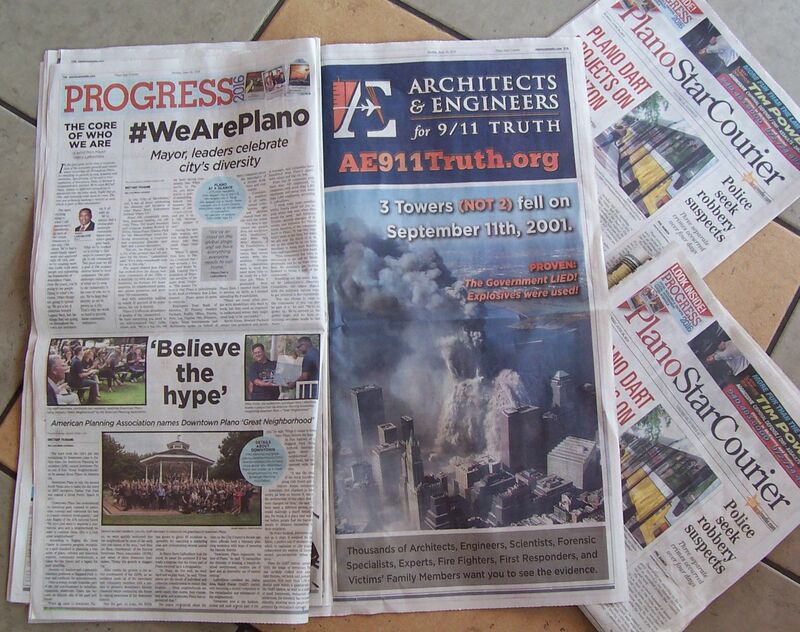 Ad is sponsored by “North Texans for 9/11 Truth”. 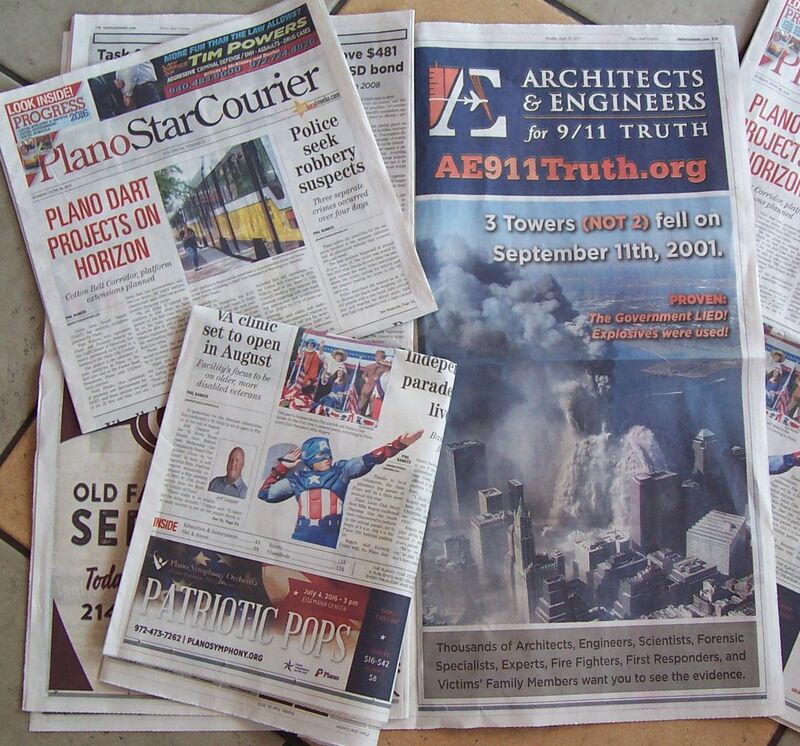 Over the past ten years, “North Texans for 9/11 Truth” has given out more than 70,000 free DVDs, literally tons of literature and has been involved in hundreds of actions and events. 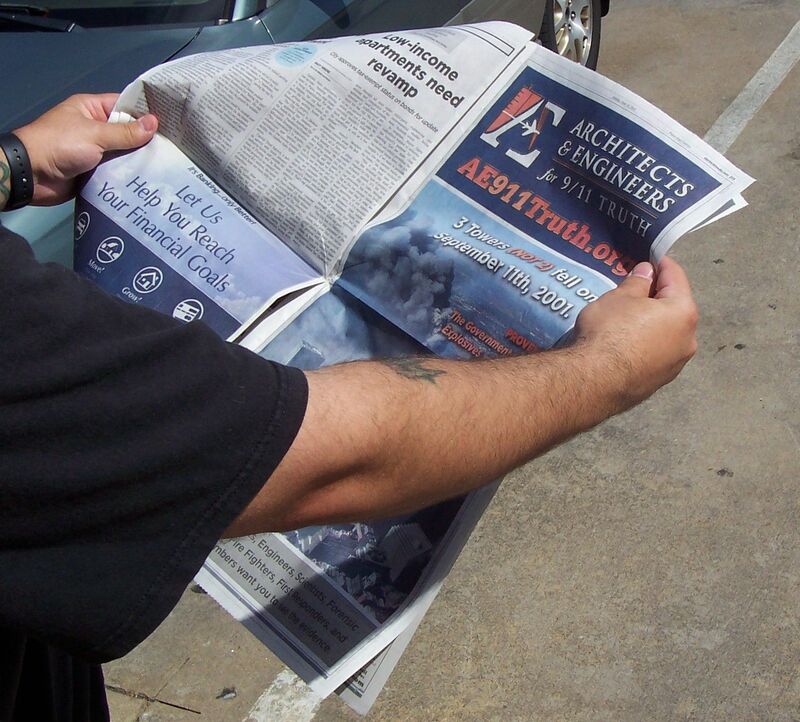 More than 800 DVDs, along with Ae911Truth.org literature was delivered to over 100 local Dallas area Fire Stations. 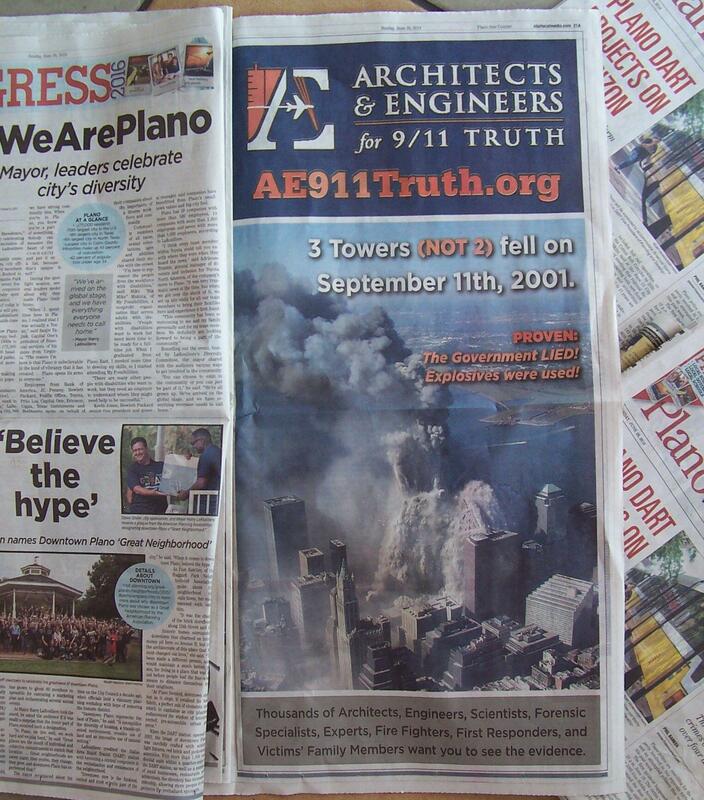 “ReThink911.org” display ads were placed in more than 15 local newspapers. I love it when someone...anyone takes the initiative to do something good and right. of people. Anyone could have done it. But TomT did it. BRAVO Tom. I applaud anyone who gets out there and makes things happen. Joe on Tue, 06/28/2016 - 4:25pm. Showed someone wtc 7 video today...the one that is just 10 seconds long. He had never seen or heard of it. He was taken aback. "Why haven't I seen this?" he asked. And the dialogue begins. Thanks Tom, for all you do for the cause. ROBinDALLAS on Mon, 07/04/2016 - 11:20pm.